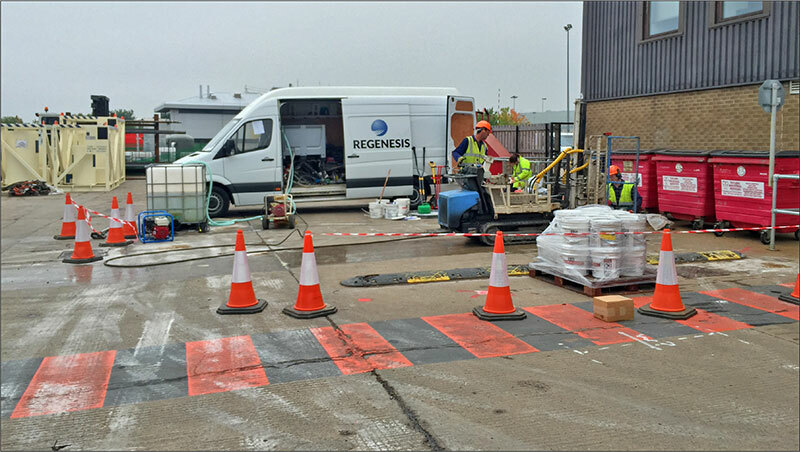 REGENESIS was approached to offer an in situ remedial solution to address high levels of mixed chlorinated solvent (TCA and TCE) contamination of the groundwater at a site in northeast Scotland. At the time, an ongoing DPVE system was operating, but was unable to achieve the remediation goal of a 75% reduction in chlorinated solvent mass. Furthermore, a supplementary MIP investigation showed that there was more contamination at depth (>6m) which the DVPE system was not able to reach. The initial design was based on treatment between 3 – 9m BGL of the aquifer across a 1,200m2 using 3DME and BDI with the preferred method of application being direct push injection. However, during the MIP investigation progression of the rods deeper than 6mBGL was found to be difficult. 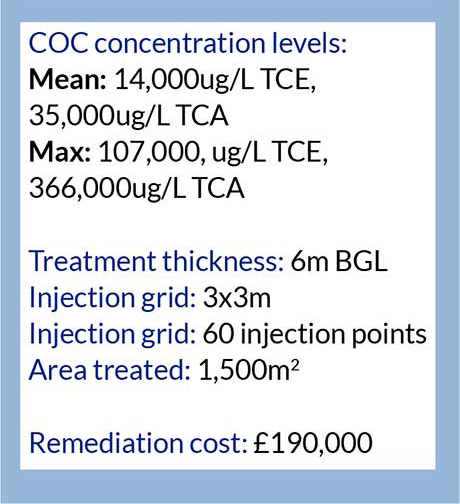 This raised concerns that (1) direct push injection would not be able to reach 9m BGL and (2) injection of the required dose of 3DMe may not be possible. REGENESIS were therefore asked to undertake a pilot study over a limited area to demonstrate that the works were possible. This was completed successfully and also showed excellent dose response and demonstrated to the site owners that the works (which were completed at night) would not have a deleterious effect on their operations. The pilot trial was conducted over two days (see figure 1) during which the direct push injection rig had no problems getting the injection rod to the required depth of 9m BGL (unlike the MIP). Furthermore, the required volume of 3DMe was accepted by the aquifer with minimal daylighting/surfacing. Following the MIP and pilot, the fullscale design was tailored to provide the most cost effective approach for the site. 60 direct push injection points were completed over 10 nights, with no disturbance to the site operations. The direct push injection points were centred on BH 11, a pre-existing well, to ensure we had good baseline data. 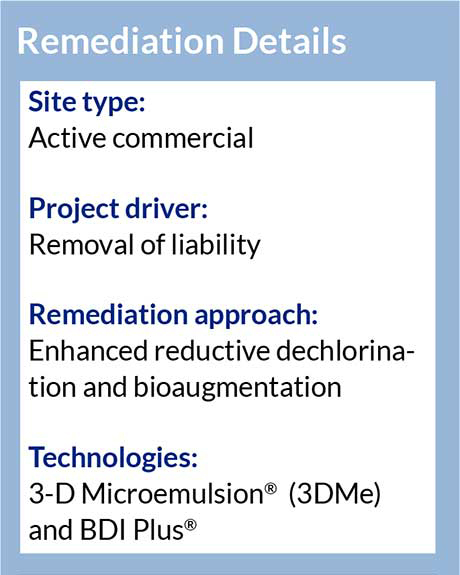 Both BH11 and the surrounding wells were monitored over 8 months to assess the effect and distribution of 3DMe. Following the injection works, quarterly validation monitoring was completed. 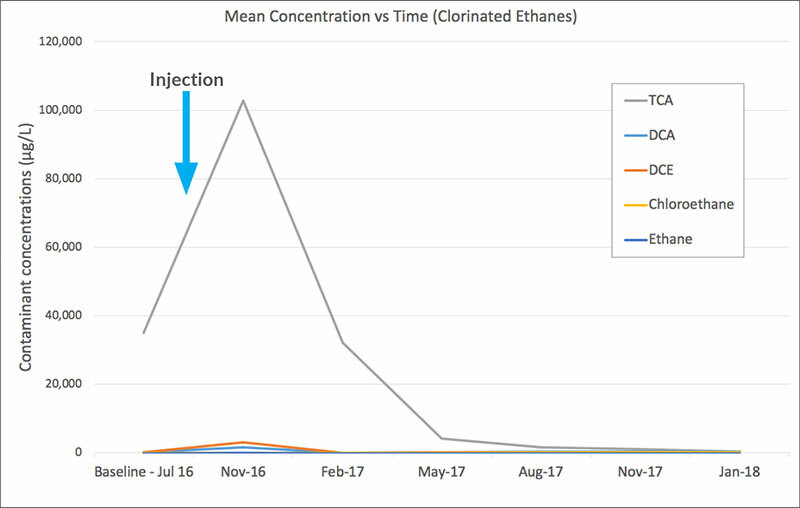 Post injection monitoring showed no inhibition of parent compound degradation due to the mixed halogenated compound plume. 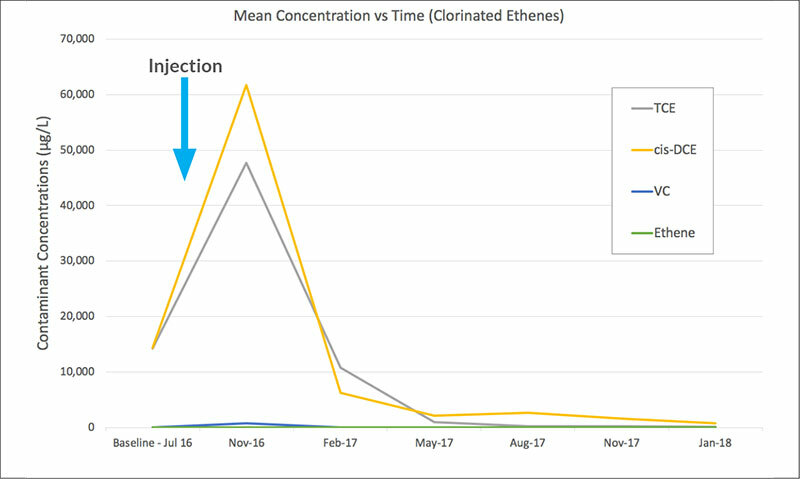 98% and 99% reduction in mean concentration of TCA and TCE respectively. 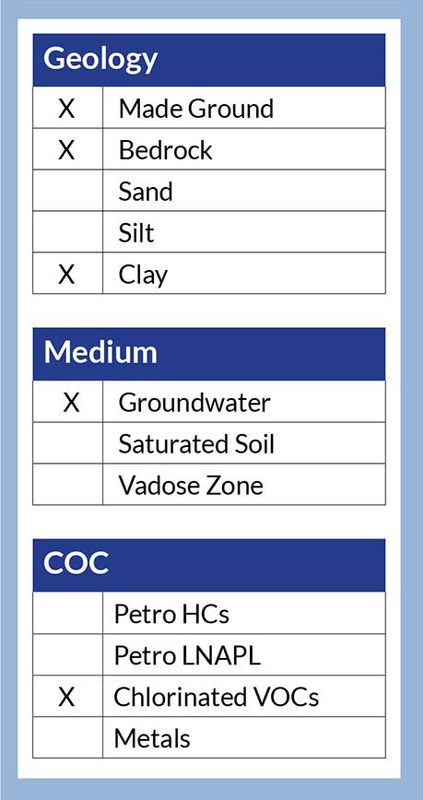 Full reductive dechlorination was achieved with no build up in daughter products (see fig 2 and 3). The validation curves suggest that both biotic and abiotic degradation occurred. Abiotic degradation occurred through the production of reduced iron species by the production of low redox conditions created by the 3DMe. A limited pilot study was used to prove the practicality and efficacy of the proposed approach. This area did not require further injection, so added little extra cost to the remediation of the site. Bioaugmentation using BDI+ avoided any inhibition of either chlorinated ethenes and ethanes by ensuring that the microbial consortia contained viable counts of dehalogenating bacteria specialising in either contaminant group. Very high levels of contamination, suggestive of DNAPL, were reduced to very low concentrations within 18 months. No build up of degradation products occurred, showing full reductive dechlorination was achieved and sustained. No disturbance of the onsite operations occurred during the limited injection time onsite, with the remediation occurring under the site as it continued to function normally.